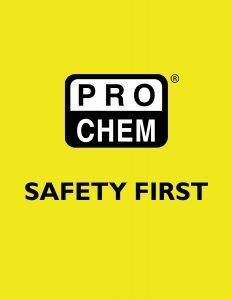 SURE GRIP | Pro Chem, Inc.
SURE GRIP is a unique aerosol that contains a specialized synthetic grit with no sharp edges. This unique formulation is a super hard, texturized one-part epoxy coating that cures very quickly and lasts for months. It has a slip resistant, rough grit surface that reduces the occurrence of slip and fall accidents, helping customers to meet OSHA requirements for safe flooring. Our new convenient aerosol makes applying an antiskid epoxy coating easier and faster than ever. Surface must be clean, dry and free of rust before painting. Protect surrounding areas from spray mist. For best results, use when can is between 50°F and 90°F (10°C and 32°C). Shake can at least one minute after rattle is heard and occasionally during use. Spray with steady, even strokes at a distance of 6-10 inches (15 to 25cm). Several light coats give a better finish than one heavy coat. Tack free in 60 minutes, fully cured in 24 hours. If clogging develops, turn spray head ¼ turn or remove and clean spray head slot. DO NOT stick pin or other object into can opening. With can and spray head pointed away from you, reinsert spray head with a gentle twisting motion. To clear spray head for future use, turn can upside down and spray for 3 seconds. Completely empty cans may be recycled or disposed of with regular trash. Dispose of partially empty cans responsibly. DO NOT incinerate or compact.